is available to help you keep track of your costs and avoid surprises on your bills. Once you’ve set an alert on your account, the Billing Alerts feature will send email notifications to billing administrators when the charges for the current month exceed the threshold you’ve set. Notifications will also be sent as your costs approach the threshold. You can cancel the alert at any time in the Google Cloud Developers Console. If you’re looking for more detailed cost monitoring, the existing Billing Export feature provides a daily export of usage and cost estimates, in either JSON or CSV formats, for easy import into your favorite tools. 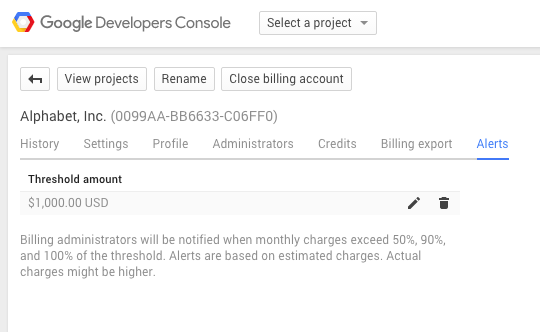 The Billing Alerts beta is available now to everyone – to learn how to set an alert for your billing account using the Developers Console visit our help center article. You can find more information about Billing Alerts here, and we always welcome feedback. On-demand computing and the efficiencies that come from being able to scale your compute resources up and down as your workload changes are part of the reason why running in the cloud is so appealing. However, that flexibility can mean that you need to pay more attention to variability in costs. Today, the beta release of Billing Alerts is available to help you keep track of your costs and avoid surprises on your bills.